A lot of people are unaware that there even is an option for an all natural swimming pool. To me, just the word natural sounds better than a chemical pool. I think anyone given a choice to have an all natural product versus one using chemicals would think it was the way to go, but when it comes to a natural swimming pool there are many things to consider. 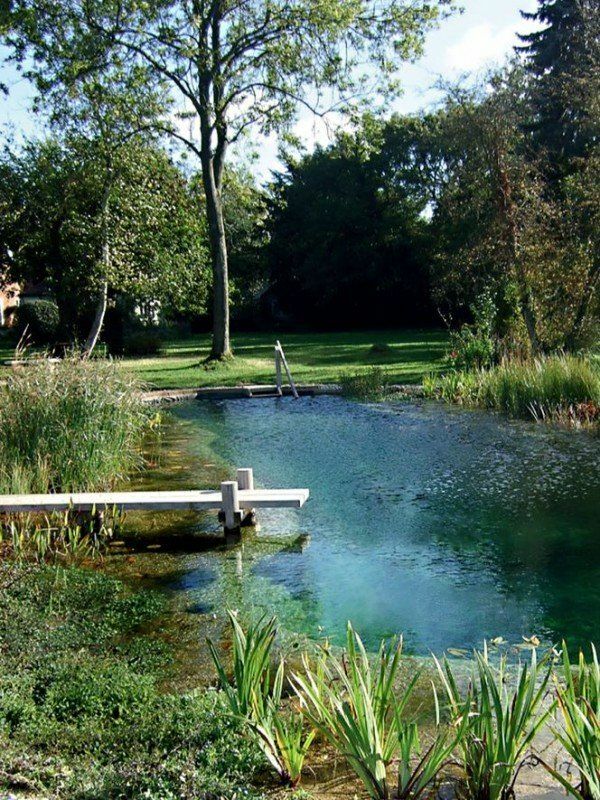 Some might be confused about the meaning of a natural swimming pool by thinking it is a pool designed to look like a pond and is more about the aesthetics than it actually being chemical free. The fact is a natural swimming pool is a containment of water, in which no chemicals are used to sterilize the water and all clarifying of the water is done with biological filters and plants rooted hydroponically in the system. You might envision a natural pool being brown like a pond with a mud bottom, but actually most are filled with concrete. You can even design a natural swimming pool to look like a traditional pool by having the gravel filter placed underground and out of sight. So, aesthetics really doesn’t come into play when making a decision to go all natural versus chemical swimming pool. Because I live in Florida where summer creates hot temperatures, one of my concerns was that a natural swimming pool may not protect against bacteria. What I have learned is that natural pools use two types of biological filters to create clear and clean water. The water is circulated by a pump through a gravel or plant filter. Gravel filters are better in warmer climates so depending on where you live your filtration system would be chosen to fit your climate needs. Natural swimming pools are good for the environment because no harsh chemicals are used to maintain its upkeep. We all should strive to find products that do not take or pollute our environment and this is a great choice. 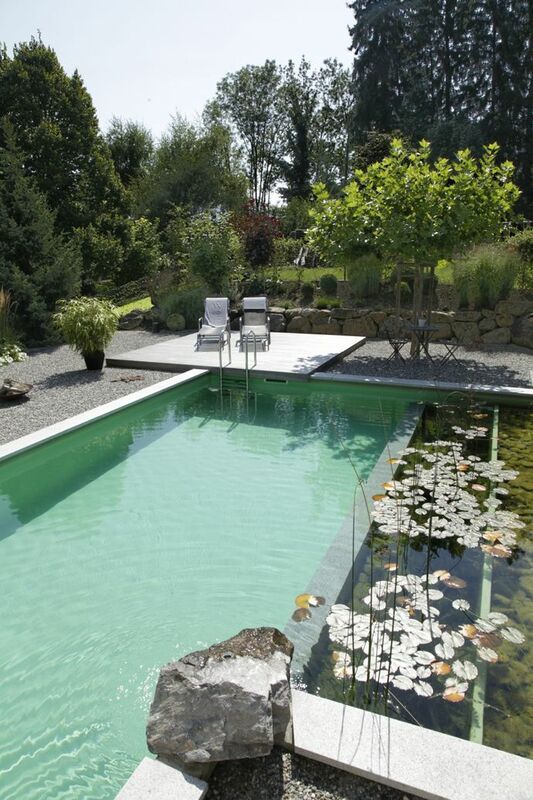 Organic pools require less maintenance than traditional pools. This also results in lower maintenance costs over the year which really adds up to great savings over time. You will not have to purchase chlorine, chemical filtration, pH balancing, or any of the other costs that go with normal pool cleaning services. You will need to keep them skimmed and free from debris. Because a natural swimming pool is void from harsh chemicals it is a healthier choice for you and your family. To me, this is the best reason to consider a natural swimming pool. A natural pool requires a second discrete pool which is part of the filtration system which will be added costs. You might not have a local pool contractor available in your area and it would cost more to bring one in. As long as you are planning to stay in your home for a long time then you will recoup the initial costs of the monthly maintenance over time. The regeneration zone needs to be as big as the pool itself which you would need to have a big enough space to accommodate two pools. Many people have a limited amount of property and a natural swimming pool just wouldn’t fit. When my husband and I did our pool I did not know about natural swimming pools, but all the materials I choose were natural materials. Anything that brings a natural feeling to an outside space aesthetically works for me. We also chose a salt water system which is not as harsh as chlorine. I am so glad to see that there is an organic option that is good for the environment and healthier for the user.